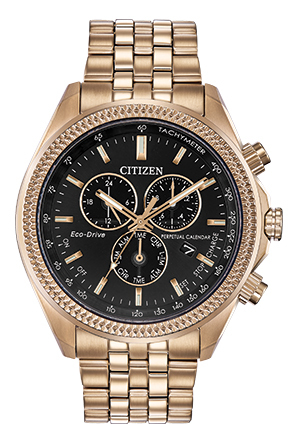 Taking it up a notch with the reinvented CITIZEN® Brycen timepiece with a 1/20-second chronograph, perpetual calendar and dual time in a rose gold-tone stainless steel case and bracelet completed with a black dial. Featuring our Eco-Drive technology – powered by light, any light. Never needs a battery.